Now that school’s back in session, don’t you just have the itch to get away? 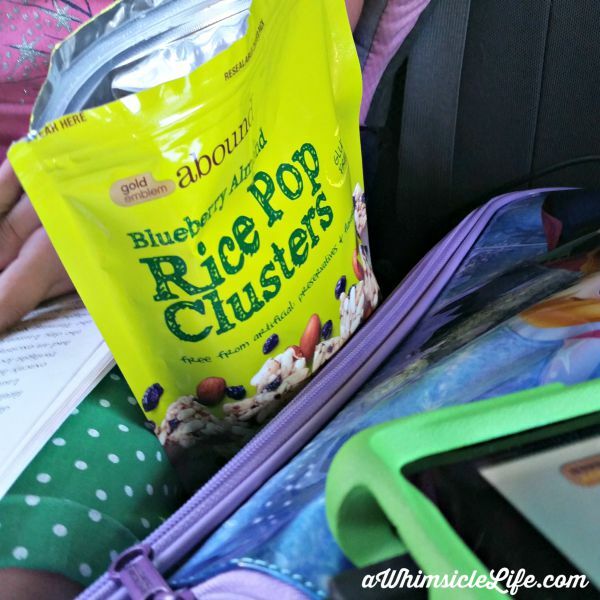 Pile the kids in the car, pack some yummy snacks and hit the road. Keep everyone happy and occupied with these easy road trip games – all that can be done with no planning ahead whatsoever. I packed a variety of our favorite CVS Gold Emblem Abound treats. I love this brand because it uses nothing artificial and the snacks are never overly sweetened. 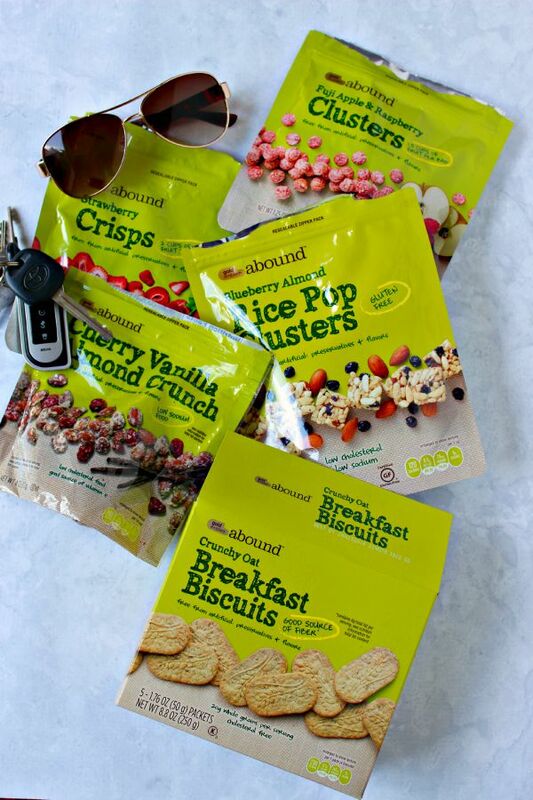 For this trip we took breakfast biscuits, Strawberry Crisps, Blueberry Almond Rice Pop clusters, Cherry Vanilla Almond Crunch and Fuji Apple & Raspberry Clusters. Why am I always so surprised while packing snacks for my family? I honestly thought this would last us the 3-hour trip there and provide us with sustenance for our drive back. Nope. We finished all of this going one way. So what else do we do to keep our family happy in the car? Tons of road trip games. My six-year-old daughter is now at an awesome age where she can play more games with us. Here are our favorites as well as some favorites suggested by my friends. 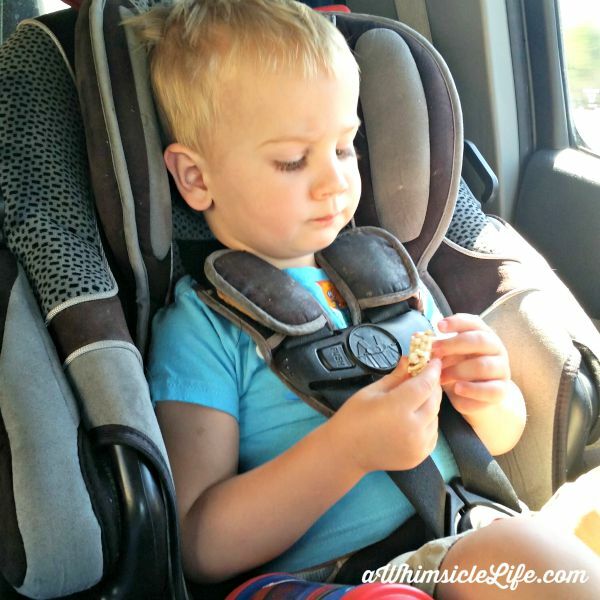 Ask your preschooler to name 3-5 things they might see out the window on the trip. Write these on a piece of paper and draw a basic picture next to each object. Hand this list to your child and let her search. If you would like to plan ahead, you can find a printable road trip scavenger hunt here. I used to play this one with my mom on road trips. While driving through New Mexico, we each chose a side of the road and tallied up the number of cows that appeared on each side. This game can be adjusted depending on the age of your child. My friend Mike likes to pick something that his three-year-old daughter likes, for instance, McDonalds, and then count those. He even gives her a tally sheet to work on fine motor skills at the same time. The game progresses when I can’t think of an answer to your question beginning with the same letter. Than I give you the next letter of my word. So say I give the next letter as “o”. You now need to think of questions where the answer starts with “m-o”. Eventually either you give up or guess the word when enough letters have been revealed. Name any category and players take turns listing items from the category. For example, if you say “candy bars,” other players will list one candy bar at a time. You are out if you repeat a candy bar someone else has said or you can’t think of another candy bar. Some of our favorite categories are breakfast cereals, tv shows, movies, books and Disney Princesses. Very similar to the Categories game above but with one additional rule – the answers must be in alphabetical order. For example, if the category is candy bars then the first person must say a candy bar that starts with the letter ‘a’, the second person says one that starts with the letter ‘b’ and so on. You are out if you can’t think of a candy bar for your letter. Play this as a cooperative game with the family working towards the goal of finding objects or road signs for every letter of the alphabet. You can also take turns if you want to mix it up a bit. Start with ‘a’ and name an object you see on the road or in the car that starts with the letter ‘a’. Then go to ‘b’ and continue from there. List out all of the States in our nation and cross off each state when you see the license plate. If you would like to plan ahead for this game, you can find a printable version here. Think of a word longer than three letters and say the first letter. Another player then says the next letter that would also make a word. The object of the game is not to be the person to say the last letter in a word. So if I say T, You say R, I say E, You say E. You lost because you finished the spelling of “TREE”. You get “one-third a ghost.” The first person who gets “three-thirds a ghost” loses. 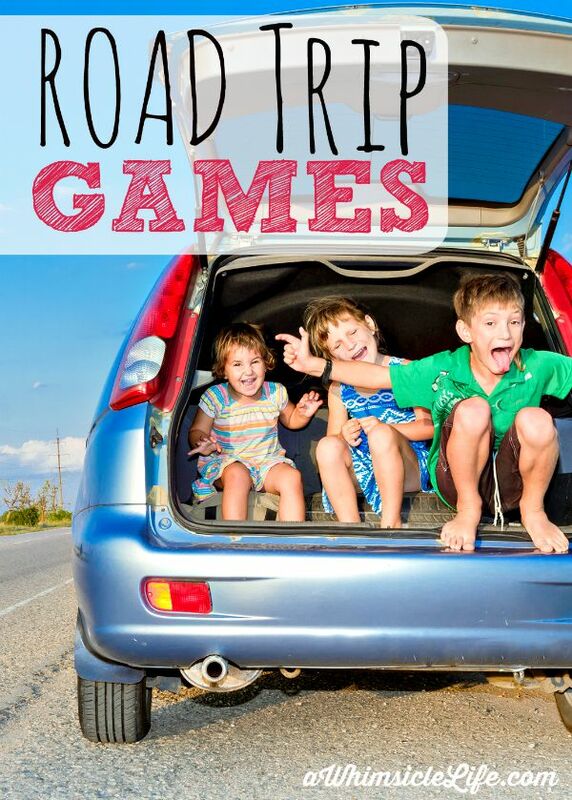 These games are guaranteed to keep your family entertained on your next road trip! Now, all you need to do it get stocked up with snacks. Enter to win a $50 gift card from CVS. I will draw the winner on Thursday September 3rd! Cool! I love our CVS. CVS rocks! The Gold Emblem Abound brand is sooo good too! Thanks for the chance! I’m going away for my anniversary soon and would love to bring those snacks. They are delicious! Thanks for entering! My daughter and I kept a running list of license plates we’d seen. Had all 50 states and some Canadian provinces and Mexican states. There was also the time I had to pull over from laughing so hard when we played “Slow Boat to China”. She could come up with some doozies! Hi, Deborah! That all sounds so much fun! Help me here though… I’ve never heard of “Slow Boat to China.” How do you play? You start off by saying, “I’m going on a slow boat to China and I’m taking ___” filling in the blank with something that starts with the first letter of the phrase “slow boat to China”. (It could be the phrase “Merry Christmas” or “Is it summer yet?”) The next person starts the same way and says what the previous person brought and then adds his/her own. Each time around they go through the whole list of things already brought. Remembering the whole list is the trick. We even added funny voices to the mix. That’s why I had to pull over on the side of the road from laughing!